In today’s world, efficiency is one of the most important qualities you can exhibit. There’s almost too much to do with work and school, not to mention throwing a Spring Break vacation into the mix. It’s also incredibly important to keep your teeth and braces clean, even while you’re on the go. Even if you’re busy, you should always make time to keep your teeth and braces clean. Admittedly, it can be difficult to remember your teeth and braces, especially when you’re distracted by everything else. 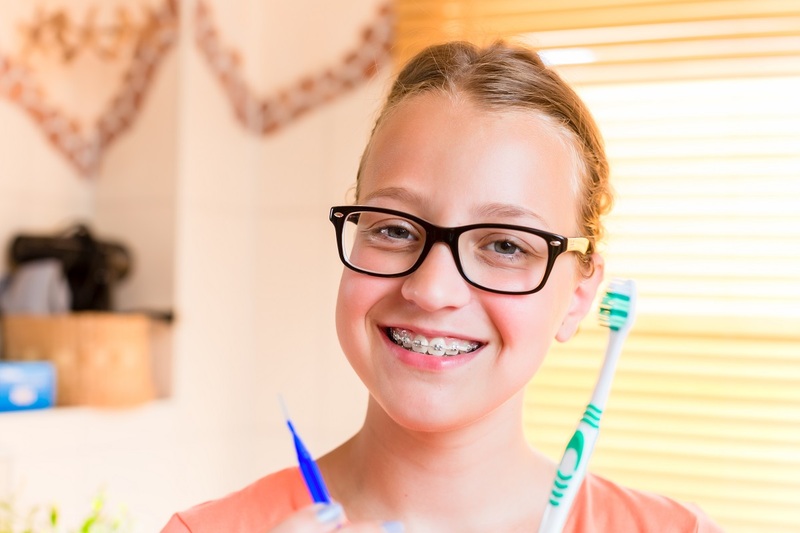 So, we’ve outlined some of the ways you can take care of your teeth and braces, even when you’re Spring Breaking on the beach. Anytime you eat with braces, you’re likely to get some food stuck between your brackets and under your wires. This is especially true with difficult food like popcorn, apples, and other similar items. It’s a good idea to rinse your mouth after each time you eat. You can buy travel-size squeeze bottles to help concentrate the water stream into localized areas under your braces. These don’t take up a lot of room, and you can easily carry them in your bag or pocket. The name may speak for itself, but these useful tools go between your braces and your teeth to clear out any stuck food. These resemble pipe cleaners and are even easier to carry around than squeeze bottles. Remember, these go between brushes are not meant to replace floss, but they can definitely help you out in a pinch. It’s helpful if you get a variety of different sizes so you can be more flexible in the way you clean the food out of your braces. Ask your orthodontist for some samples of go between brushes. You can also buy them at any drug or grocery store. Floss is one of the best ways you can keep your teeth and braces clean without taking up too much space in your pocket or your bag. In fact, anyone who has braces should carry some floss with them at all times. Flossing allows you to reach all the tight spaces between your teeth and braces with ease. However, getting floss between your teeth and braces can prove to be difficult at times, so get some floss threaders to help you out. You loop your floss through the threaders, and then use the threaders to get the floss through your teeth and braces. Rinsing, flossing, and using go between brushes are perfect for targeting specific pieces of tools, but sometimes you just can’t beat a good brushing. Don’t be afraid to pack around a travel toothbrush in your bag or pocket so you can quickly clean your teeth and braces after eating. Taking the time to do it after you eat will save you the discomfort of food stuck in your teeth all day long, especially when you’re trying to have a fun time. Whatever tool or method you choose to keep your teeth and braces clean on the go, just remember to just do it! Having sore teeth from food stuck in your braces is not something you want to experience. Cleaning your teeth on the go might seem inconvenient, but it will help you overall in the long run.